Let your mom know how dear she is to your heart with this #1 Mom tri-tone heart pendant in 14K gold from Apples of Gold Jewelry. Show your mom that she is the best mom in the world with this pendant, which is made from 14K yellow and rose gold with white rhodium. 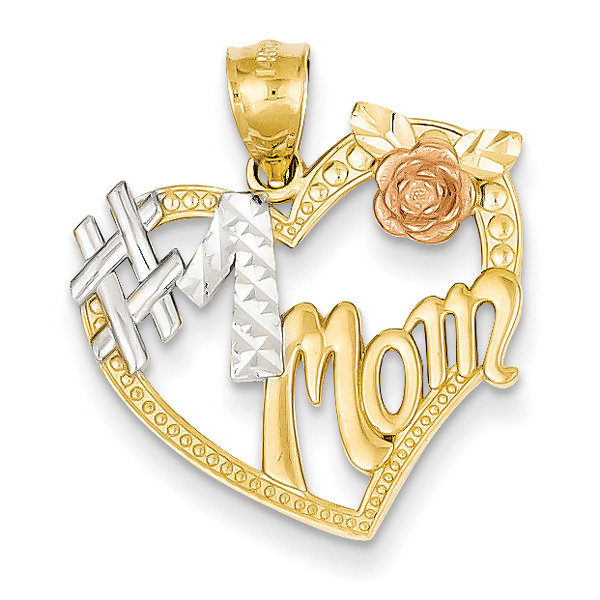 The pendant has a heart with "#1 Mom" written inside, with a pretty rose in the corner. The #1 is in white rhodium, while the rose is made from 14K rose gold. The rest of the pendant is in 14K yellow gold. The pendant measures 7/8" tall by over 3/4" wide, and weighs approximately 1.67 grams. This pendant is made in the U.S.A.
We guarantee our #1 Mom Tri-Tone Heart Pendant in 14K Gold to be high quality, authentic jewelry, as described above.